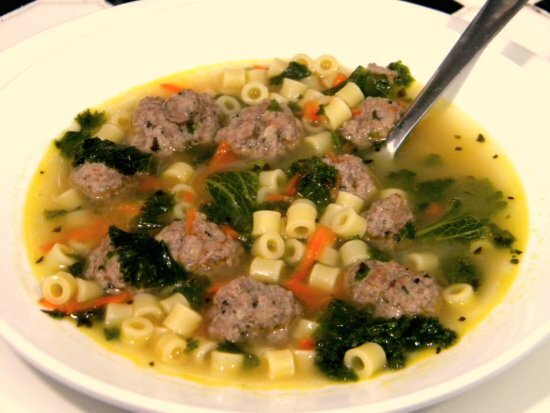 Italian Wedding Soup has nothing to do with weddings. Sad, but true. You know I always pictured a chaotic, joyful wedding scene with people happily slurping up this particular soup. I figured there was some sort of symbolism in the ingredients. I had woven an intricate web of romantic possibilities around the recipe. And none of them are true. Not one. It seems that the name comes from an Italian phrase, si sposono bene, which means that two things are well married; they go together well. It may have been served at a wedding or two but only because it is delicious, not because it is symbolic. Another fantasy lost. The absolute truth is that once you taste this (if you have never had it) you won’t care whether it is served at weddings, has symbolism, or was developed by inmates working in a state penitentiary kitchen – it is just that good. Unlike many soups, you don’t have to simmer it for hours as long as you start with a good chicken stock. Homemade chicken stock is great but Pacific has a free range organic stock that I like a lot. I added a little extra flavor to the meatballs with dried basil, smoked paprika, and ancho chile pepper. This makes a lot. It is just as good the next day, although you will probably need to add water since the pasta will soak up the broth. The soup seems like it is light because it is clear chicken stock, meatballs, a little pasta, and some greens – dont’t let it fool you. This stuff will fill you up fast. Serve it with some garlic bread, a salad, and a light dessert for a casual, filling meal that everyone will love. 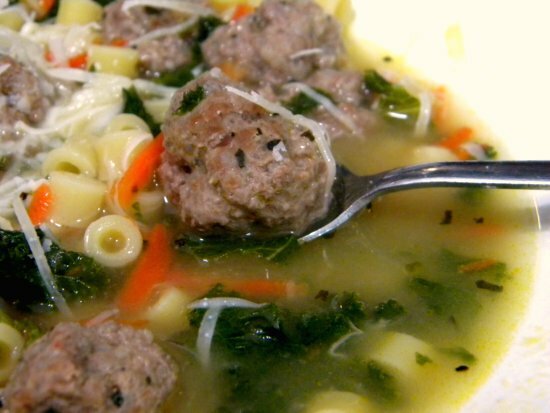 A delicious soup filled with meatballs, greens, and pasta in a light chicken stock. Low calorie, low fat, high flavor. Mix the sirloin, egg, Panko, basil, chile, and paprika. Knead the mixture with your hands until very well mixed. Add all of the remaining ingredients except the cheese. Simmer until the pasta is done.